The National Tour of The Wizard of Oz is a an adaptation of the classic movie. This is the same production that played at Miami's Arsht Center this past fall, and it's playing at the Kravis Center in West Palm Beach through this Sunday. Direct Nigel West recreates the movie with a cast including Noah Aberlin, Cassie Okenka, Jason Simon, and Chris Kind. It takes chutzpah to adapt a classic movie such as The Wizard of Oz for the stage. In doing so, the production now at the Kravis Center bit off more than it could chew. ....the production cannot overcome the dullness brought on by mediocre performances, near-verbatim parroting of the 1939 movie and uninspired direction. It's likely that the show's producers are banking on families to fill seats. Casting local dance students as Munchkins and Winkies (the Wicked Witch of the West's minions) probably contributed to that goal. Students from the Academy of Ballet Florida played those roles at the Kravis. Thanks to their unabashed enthusiasm, the audience's attentiveness picked up measurably when they were on stage. After all these years, Oz remains the perfect family entertainment, a show that will entertain the little ones while bringing out the little kid in the rest of us. Judging by the reaction at Tuesday’s opening night performance, the more mature members of the audience were having as much fun as the children. The cast does a terrific job, led by Cassie Okenka as Dorothy. Her voice is strong and true and she sings Over the Rainbow with the type of quiet conviction that’ll almost make you forget Judy What’s Her Name? Okenka also brings a fresh-faced charm to the iconic role. Meanwhile, Jason Simon is hilarious as the Cowardly Lion and the wobbly-legged Noah Aberlin makes a mighty limber Scarecrow. Toto the dog, however, basically steals the show as he scampers on and off stage right on cue. Wisely, the stage show remains faithful to the movie, except for one delightfully high-stepping and colorful jitterbug scene that’s a welcomed treat in act two and wonderfully choreographed by Leigh Constantine. Director Nigel West and adaptor John Kane hit most of the iconic moments in the film and suggest equivalents for most of the memorable visuals. (OK, the Horse of a Different Color had to go, but that is the rare exception.) And when they cannot come up with a way to reproduce an effect live, they resort back to film, as they do for the tornado and the resulting flying house. The bigger problem is that West has encouraged his actors to mimic the performances in the movie version of L. Frank Baum’s timeless tale. Cassie Okenka has a lovely singing voice and her Over the Rainbow is a stirring beginning to the Harold Arlen-E.Y. Harburg score, but her line recitations are disconcertingly similar to those of Judy Garland. At least choreographer Leigh Constantine seems to have been given free rein to inject some ingenuity into the show’s dances, as he does with the sleep-inducing poppies, the nattily dressed crows and the elegant, animated trees. This traveling stage production has a tradition of enlisting a local dance studio’s moppets into the company to fill in as Munchkins and as the Wicked Witch’s palace guard, the Winkies. Here the assignment goes to The Academy of Ballet Florida, with the school’s principal Donna Morgan handling the staging of her brood. They do fine, even if they do stick out as obvious tots, but then the whole company seems a tad young for their roles. But if your youngsters remark on the way home that they prefer the movie over the overlong stage show, they may have a future in the reviewing game. To be sure, there is an effort to bring the 1939 film version of the L. Frank Baum classic book (published in 1900) into the cyber-riffic age of video games and CGI. But beyond all the pyrotechnics, this story is centered on Dorothy. But you just can't totally shake the old-schoolness. Sometimes things are so old, they become new and fresh again ... particularly to a new, digitized generation. You know what? Trying to find meaningful quotes in this is making me nauseous. Just go read it. 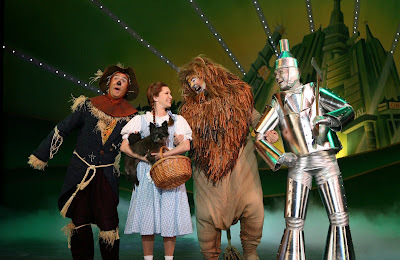 Anyway, The Wizard of Oz at the Kravis Center blows out of town Sunday.